OVER 150 residents who live near the San Jacinto Superfund Waste Pits, packed the Highlands/San Jacinto Community Center last Tuesday night, to hear an update on facts about the Waste Pits, and to get more information on the testing of their well water by the Harris County Pollution Control department. Jackie Young, at right, speaks. 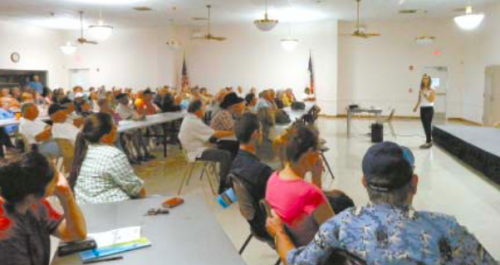 EAST HARRIS COUNTY – Jackie Young, president of the new organization THEA and the San Jacinto River Coalition, held two meetings to update the public on the status of work on the Superfund Waste Pits. Last Thursday she met with interested parties at the J. D. Walker Community Center in McNair, and this week on Tuesday night she met with the public at the Highlands/ San Jacinto Community Center. Each meeting had about 150 attendees, with only a few at both. Young said that attendees were evenly divided from affected neighborhoods around the Waste Pits, including Channelview, Lynchburg, Highlands, McNair, and Baytown. Young spent a lot of time on technical and chemical information, explaining to the interested crowd how Harris County tests had discovered possible contamination, even dioxin, in the well water samples it drew in June. She said that Harris County Polution Control had sampled and tested 100 wells. Of these, 28 had shown to be contaminated, and the well owners had received letters from HCPC telling them “Don’t Drink the Water” until retesting had been completed. Young explained that she understands when the samples were tested, other samples were open nearby, and may have compromised the well water samples. Harris County is using money from the lawsuit settlement to pay for the testing. Each test, if searched for all contaminants, costs $2,000 and therefore the whole testing program cost $200,000. This was paid for out of the $10 million dollars that the county received from the lawsuit. Precinct 2 has said that all the money will be spent on environmental projects within 5 miles of the Waste Pit site. They have not currently decided how the rest of the money will be spent, but there is under study a proposal to provide water and sewer lines in some of the affected areas. Young explained that even though the lawsuit awarded $29.2 million to the plaintiffs, including the county, this money cannot be used for individual relief from health problems or well water contamination. These situations must be settled in private lawsuits against the responsible parties, she said. REP. GENE GREEN SPEAKS on the floor of the House of Representatives, urging Congressional action on the ZIKA virus, and the removal of the Waste Pits from the San Jacinto River. 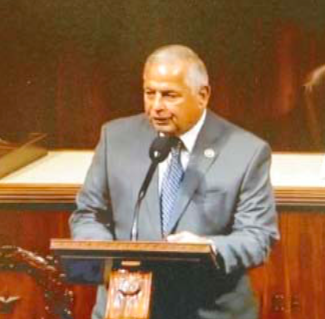 WASHINGTON – Congressman Gene Green continues to press the government for action on environmental issues, including the removal of the Waste Pits from the San Jacinto River, and funding to eliminate the Zika virus. In a letter to EPA chair of the National Remedy Review Board, who will eventually rule on the method of remediating the Waste Pits, Green urged complete removal of the dioxin waste. Currently, the San Jacinto Waste Pits are partially submerged, and contained under a temporary cap near the western bank of the San Jacinto River, immediately north of the I-10 bridge. The pits were created in the mid-60’s by Champion Paper and McGinnes Industrial Maintenance, who filled the ponds with waste paper sludge from a local paper mill until 1968, when they were abandoned. PASADENA, Texas – The Hovsepian family can happily say that San Jacinto College has had an impact on three generations of their family. Nico Hovsepian, his mother, his wife, Cassandra, and his daughter, Christian, all attended and were later employed by the College. When Hovsepian finished his time in the military he was ready to start his career. He enrolled at San Jacinto College and started working toward an associate degree of applied sciences. While earning his degree, Hovsepian worked at University of Texas Medical Branch (UTMB) in Galveston for two years. Eventually his mother, a San Jacinto College employee, came to him with a suggestion. “My mom mentioned that San Jac was hiring and that I should apply,” says Hovsepian. “She told me that she really enjoyed working here and that the people were great. She said it was like family,” He quickly applied for the job in the IT department and focused on finishing his degree. “You become a part of a community inside of a community when you come to San Jacinto College,” said Hovsepian. During both his time working and studying at the College, he felt that he had become a part of the family. 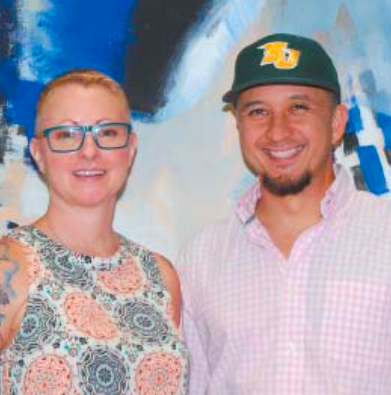 That family grew to include his wife, who holds an associate degree of arts and behavioral sciences from San Jacinto College, when she started working at the College just two weeks after Hovsepian started his own job here. 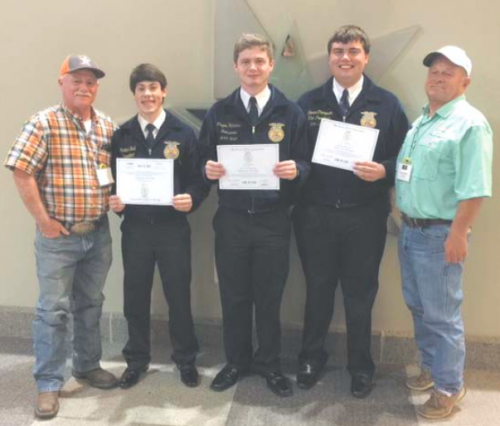 Four members of the Channelview FFA received their Lone Star Degree at the Texas FFA Convention. The Lone Star Degree is the highest level of membership awarded by the state association. Degree recipients, wearing their FFA jackets, from left, are Hunter Bell, Clayton Hutchins and Trever Thompson. Not pictured is the fourth honoree, Yvette Leos. Channelview FFA sponsors, at far left and right, are Wesley Hutchins and Dominic Mazoch.